Update June 2015: Google is retiring the SMS features from its calendar notifications. In principle, this guide works but you must know that on June 27th SMS delivery will cease unless you become customer of Google Apps. It’s highly likely that any SMS notifications you’ve already set up will be changed over to the pop up notifications automaically. For this reason it is important to sync Google’s calendar with the calendar on your iOS or Android smartphone. Do you participate in Twitter tweet chats? Are you busy and sometimes forget to attend? If you haven’t already tried it, Google’s free SMS calendar tool could keep you on track by sending preset text messages directly to your phone. It’s like having a personal assistant in your pocket and I’ll show you the benefits of setting it up. I use the phrase “SMS” and “text message” interchangeably. The beauty is, you can send as many texts as you like and it’ll never cost you a penny. Just have an active SIM card installed in your phone and you’re good to go. Although I’m mainly interested in SMS reminders, the Google calendar also sends emails. Obviously, you would need to enable Gmail on your mobile device and ensure you have WI-FI enabled all day, otherwise you’ll miss the email. 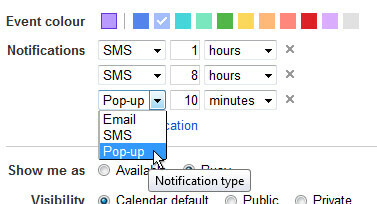 Calendar pop up notifications are available too, but you’ll need to be signed in to Google to receive those. You’ll probably prefer receiving the text messages; there’s a low barrier of entry since your phone network carrier is forwarding the message directly to the handset. You simply create an event on the calendar and add the details. 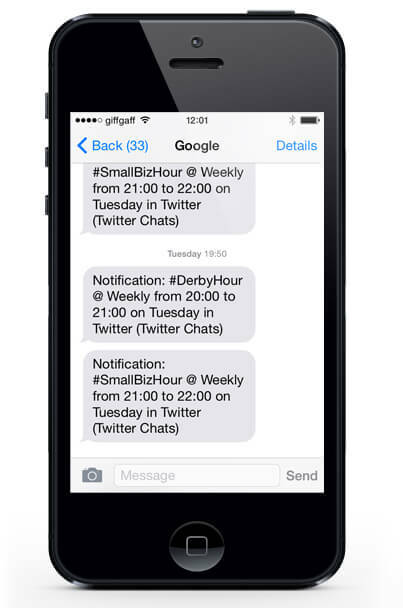 Most tweet chats are weekly, so you can set the SMS to send every week indefinitely. To get notifications I use an iPhone 4s but any phone will that can receive SMS will work. I like to set the SMS to send earlier in the day before the chat commences, and then an hour or perhaps even 10 minutes before the chat begins. That way I’ve received fair warning. It’s good to have time to prepare. So, how do we set up Google Calandar to send the text messages? If you’d like to learn more about Google SMS setup, I’ve produced a YouTube video and a SlideShare presentation. Only one phone number can be registered per account, but you can change them around if you want. Register a second Google account and create another calendar if you wish to receive notification on more than one phone at a time. 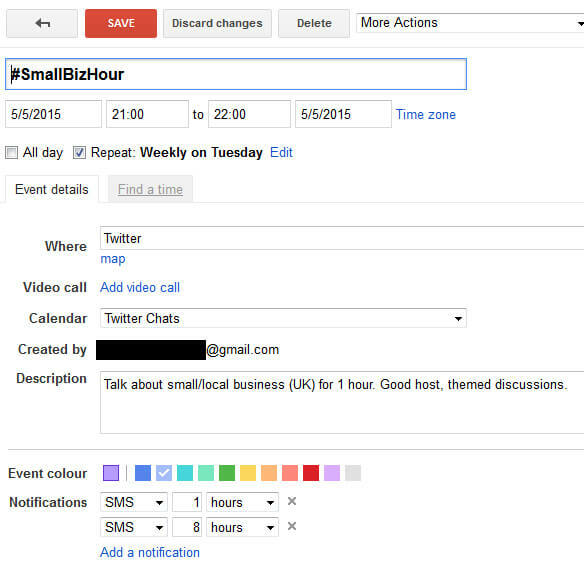 Below is a video showing how I have created a dedicated calendar for Twitter chats within the main Google calendar. It’s important to segment different activities to help you stay organised. The video is a little long at 5 minutes but I’m sure you’ll find the idea very useful and a massive time saver. It’s pretty annoying for many that Google removed SMS reminders. While popup notifications work they’re not obviously as effect as SMS reminders. At Appointment Reminder we’ve created an integration with Google Calendar that allows your automatically send reminders direct from Google. If any Small Biz Geek followers would like to see how it works would love to show you a free demo. 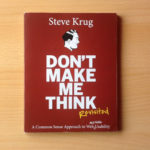 Are these reminders for me or reminders to send to clients? How much is it? What I liked about Google SMS is that when I received the messages I would forward them to clients manually via my mobile phone handset.